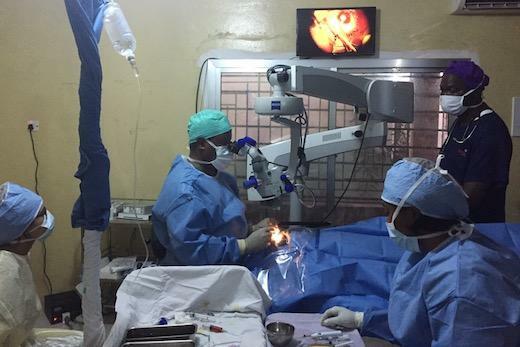 Cataract surgery can be safely performed on Ebola virus disease survivors with impaired vision, Emory Eye Center ophthalmologists and 40 colleagues around the world report. Their findings were reported in the journal EBioMedicine. After the outbreak of Ebola virus disease in West Africa from 2013 to 2016, thousands of survivors were at risk for impaired vision because of uveitis, eye inflammation that can lead to pain, light sensitivity, and severe vision impairment, often due to cataracts. An estimated 13 to 34 percent of Ebola survivors have developed uveitis with varying degrees of severity ranging from mild disease to blindness. The eye is considered "immune privileged", in the sense that a virus can be cleared from the rest of the body while persisting in the ocular fluid. Thus, invasive ophthalmic procedures on Ebola survivors possibly pose a risk to health care workers and other close contacts. Steven Yeh, MD, and Jessica Shantha, MD, from the Emory Eye Center and Colleen Kraft, MD, from Emory University Hospital, along with multiple United States and international partners, report that 50 Ebola virus disease survivors in their EVICT (Ebola Virus Persistence in Ocular Tissues and Fluids) study tested negative for Ebola virus in their ocular fluid. Thirty-four subsequently underwent cataract surgery with vision restorative outcomes. Specifically, visual acuities improved from the Hand Motions level (worse than legal blindness) to the 20/30 visual acuity level. "These findings are truly exciting, as they improve our ability to impact vision care and quality-of-life for thousands of Ebola survivors at-risk for eye disease," says Yeh. He is the M. Louise Simpson Associate Professor of Ophthalmology, Uveitis and Vitreoretinal Surgery, Emory Eye Center, and an affiliate of the Emory Global Health Institute, Emory University. First author Jessica Shantha, MD, assistant professor of ophthalmology, uveitis and medical retina at the Emory Eye Center, performed this research as part of the National Institutes of Health Building Interdisciplinary Careers in Women's Health program and while a Uveitis Fellow at the Proctor Foundation, University of California San Francisco (2016-2017). Colleen Kraft, MD, is associate professor of pathology and laboratory medicine in Emory University School of Medicine and medical director of the microbiology laboratory in Emory University Hospital. World Health Organization Interim guidance for the care of Ebola virus disease survivors includes the avoidance of elective surgery until more information is obtained about the persistence of virus in body fluids. The EVICT Study continues the dialogue about the timing and method for approaching elective surgery in organs that are considered immune privileged, particularly the eye, where vision restoration can impact patients' quality-of-life in West Africa. The surgeries were performed at Lowell and Ruth Gess Eye Hospital in Freetown, Sierra Leone. The authors note that they performed ocular fluid sampling in full personal protective equipment, and their research paper in EBioMedicine provides a diagram showing the layout of the hospital, indicating where sensitive procedures were performed. The patients were identified through a screening program from 2015-2016 with referrals from eye clinics throughout the country. Testing was performed at an average of 19 months after patients' diagnosis with Ebola virus disease in the first phase of the study and at an average of 34 months after diagnosis of Ebola in the second phase of the study. Most of the study participants had cataracts with severe vision impairment or blindness but did not have active eye inflammation at the time of surgery. The authors point out: "Our study cannot determine if survivors with uveitis may have harbored EBOV in their eye at earlier time points when ocular inflammation was active." This study represents the first systematically collected evidence evaluating Ebola virus persistence in the eye fluid of survivors. Given the thousands of survivors in West Africa at-risk of complications of uveitis, efforts to address ongoing medical and surgical eye care needs of Ebola survivors are urgently needed, they say. The research was supported by an unrestricted grant to the Emory Eye Center from Research to Prevent Blindness, and a core grant to Emory University from the National Eye Institute. Dr. Shantha was supported by the Building Interdisciplinary Careers in Women's Health of the National Institutes of Health (K12HD085850). Funding sources also include grants from Emory University Research Committee, Marcus Foundation, Emory Global Health Institute Seed Grant, Santen, Alcon Research Institute, Bayer, the Heed Ophthalmic Foundation, and the Emory Center for AIDS Research (P30AI050409).